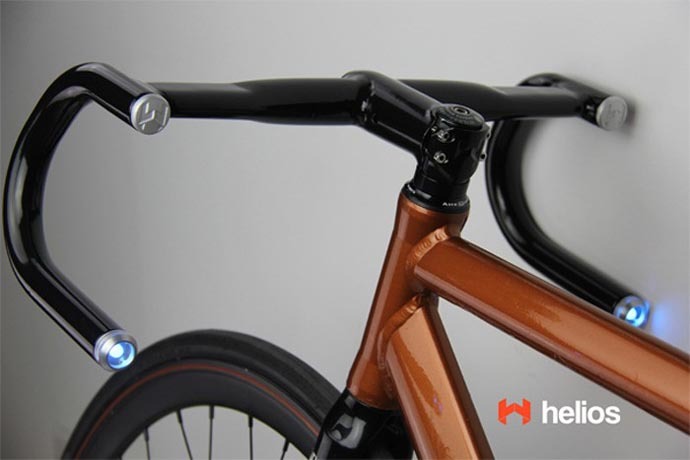 Helios is the world’s first integrated headlight and indicator system for bicycles; Bluetooth and GPS-enabled intelligent handlebars that add smart features to any bike. Proximity Lighting allows your bike to sense your presence and automatically turn on its headlight when you’re near, and off when you’re not. Indicators – rear lights can blink to indicate turns. Satnav – Use Google maps to plot a route. The rear lights indicate when a turn is approaching. Why aren’t bicycles sold with built-in lights? There is no requirement for a car to have headlamps to pass an MOT or be driven legally during daylight hours, but that doesn’t stop manufacturers including them on every model they sell. They do it because they have assumed most motorists want to drive at night. So why on earth are things so different when it comes to bicycles? Lights, mudguards and anti-theft devices have been incorporated into car design from the very earliest days of motoring, but cyclists are still waiting for these staple features. It is possible to buy a bicycle already fitted with mudguards and lights, but in this country it’s very much the exception rather than the norm. And if these items were factory-fitted they could be incorporated into bike, which makes possible designs that are more elegant and difficult to steal than most after-market accessories. Integrated technology in cars didn’t stop at mudguards and it’s now impossible to buy even the modest city car without airbags. There’s no doubt that bicycle have a lot of catching up to do, but it could happen very quickly if major bike manufacturers adopted the design and technology being pioneered by Helios. I’ve seen stupider gee-whiz geegaws than this, but not by much. Rageahol, why do you say that? There’s no point in making a comment unless you give reasons for your opinion. what are you talking about? Are you a troll? well you won’t need to worry about being a troll if you come off at 25 mph and split your head open. That was exactly my thought. The video lost a lot of credibility from the moment I saw him without a helmet, then got worse when I saw him riding on the sidewalk. Then him parking against the restaurant, in the walking pathway? Oh, Jesus. And you can’t compare Dutch to American cycling conditions. The Dutch have a driving population that’s used to seeing bikes, numerous amenities (separate lanes everywhere, bike traffic signals), heavier and less-sporty bikes, and favorable legal and medical systems. Riding in San Francisco (where this video was shot) is nothing like riding in Rotterdam — and I’ve lived in both places. I know this seems irrelevant to the product… but it isn’t. Don’t tell me about safety and responsibility when your actions don’t match your words. I don’t trust this inventor’s voice. Any safety addition is a good idea and giving you the ability to not need to worry about finding your bike lights, lock etc before leaving the house is an added bonus.i like the concept of what has been attempted but feel it is also flawed predominantly from the rear. For a start no driver has any idea what the lighting systems mean on the bike and with them changing colour so much depending on you’re speed over complicates it. It is flawed further on the bike shown which is basing itself on a racer which by design is aerodynamic. The bar ends are always going to be pointing into the riders knees rendering them totally pointless. Appearance and idea. Gen 2 required. There is nothing new here. 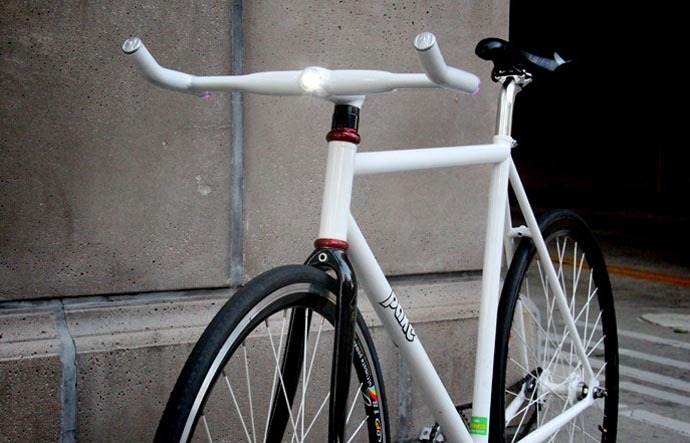 Bicycles have been sold with integrated lights for years now. These bicycles also come complete with mudguards, chainguard, carrier, stand, fixed lock, adaptable steering position and a wide choice of gear systems and gear ratios, all as standard equipment, not as additions. There is no need to go to an exotic location to buy these bikes, they are freely available in the country next door, the Netherlands. Why these bikes are completely overlooked by the British (there is only one shop in Britain selling them) is still a mystery to me. Look for these makes: Gazelle, Batavus, Sparta, Union. It’s about time to get serious about bicycles and cycling, this showing of gimmicks won’t lead anywhere. I like the ideas, but not the handlebars, but in order for them to be of use you have to have eagle-eyed drivers who also understand what the indicators are signaling. In the video you seem not to have a rear light, why not if you are designing for safety, plus not locking your bike doesn’t stop it from being stolen, who wants to spend time chasing a stolen bike? Similar to comments already made. . No rear light? This is a requirement in th UK and am surprised it is not in CA. Rear indicators would also be useful . As the lights are built into the handle bar I presume they are powered by batteries? How are they accessed? Would this affect the integrity of the built in nature of the lights? How does the bike know you are in proximity ? Would every passer by automatically turn the lights on? This would draw attention to the bike and maybe make it less secure. I like the headlight, I have too many things attached onto my handlebars. I wonder if this could be connected up to a dynamo? You could not rely on the bar-ends for a rear light, but no harm in these extra LEDs, they would not take much power and they would give an idea of width. I don’t currently use a GPS but have thought about it and it would be good to have it inside the bars. I think that it’s time to be thinking about the application of new technology to cycling. No helmet and no rear light have already been pointed out. Also no brakes! A truly terrifying cycling video. Great idea in principle – 1) they need rear lights (I’d love to see this ion all bikes – so many mainly young men cycle round my city without lights, it’s a machismo thing, really dangerous and unnerving; 2) it’s a shame it wouldn’t work for ‘staider’ cyclists – I couldn’t now manage (at 64) with drop or bullhorn handlebars. And yes, I have no idea what the changing colours are about. But let’s give the guy his due, even if he is younger/prettier/fitter than me. Hopefully he will go on to further more practical developments and a dealer in the UK will take up the idea and ignore some of the sour grapes comments above – dear oh dear oh dear. Look at this as an idea and as a work in progress (which it is; the video doesn’t tell you to send money now). It starts with a built-in headlight, and starts adding on things. And more things can be added on. Think about it: a decade ago, would you have imagined that you’d have accelerometers in your telephone, or that they would allow all the apps we now take for granted? There are lots of ways the smart bike concept might be actually useful. Many commenters went ape because he wasn’t wearing a helmet. I think he’s just an urban hipster, with hipster clothing, hipster non-helmet, etc. I’ve worn a helmet since 1972, but I don’t view this as a litmus test of the validity of the smart bike idea. I’ll save my own emotional energy for other arguments.